This is an artist rendering of what the Hall of Fame monument will look like. It will be located on the southeast corner of the Crawford County Courthouse. 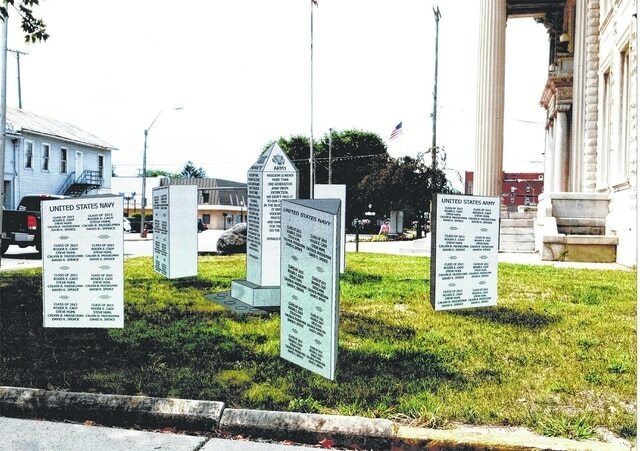 The Crawford County Veterans Hall of Fame is still accepting inscribed brick and granite pavers to help raise funds for its proposed monument project. The organization would like to contstruct a monument on the southeast corner of the Crawford County Courthouse property to honor veterans. The pavers will surround the monument structure. The monument will be created by Longstreth Memorials and will have inscribed names of all veterans that have been inducted into the Veterans Hall of Fame, about 60 to date. CCVOF inducts five veterans each November. “This is a county veterans project. Not any one veteran organization,” CCVOF President Chuck Christman said. As of the end of May, he explained the organization has raised $25,000 for the monument, including a $5,000 match from the Community Foundation for Crawford County. In total, the project will cost $80,000-100,000. “You don’t have to be a vet or live in Crawford County to buy a paver,” Christman added. He said they are asking for support from the community to get the project done. Christman also said that the idea for the project belongs to Delmer Click, who has pushed for it since 2006. Click passed away in 2012. All local veteran organizations have paper copies of the paver form. Click here to view the form online. For more information, call CCVOF at 419-562-4740 or visit www.ccvhof.org. The Crawford County Veterans Hall of Fame, Inc. has been established for the sole purpose of recognizing the lifetime of accomplishments made by veterans that were born in Crawford County, or who have fulfilled the residency requirements put in place by the Crawford County Veterans Hall of Fame, Inc.